I love this recipe and it works every time! After trying a few others from the internet I finally found one that is near fool-proof. 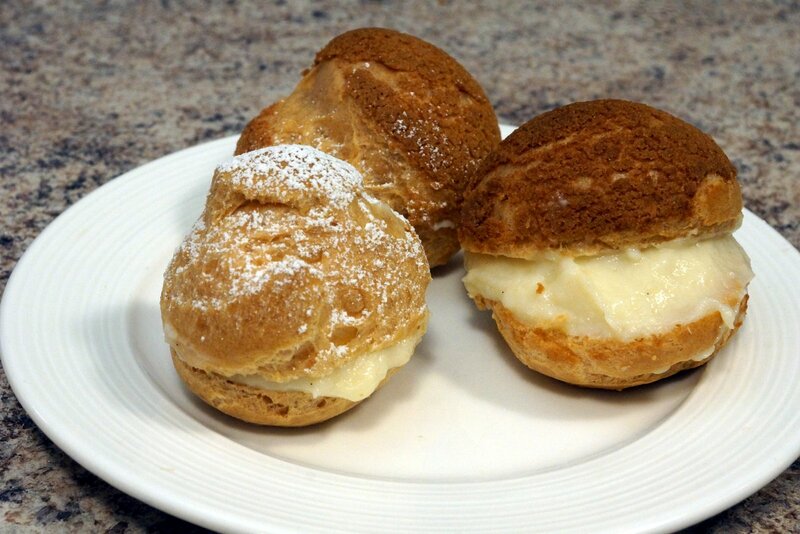 Choux pastry is finicky, the smallest details can affect the shape and how it rises. Check out this recipe from the Tummy Train here! Feel free to double this recipe if you want two trays but for me, it made around 16 decent size choux shells. 1) Sift the flour, sugar and salt into a bowl. Preheat your oven to 400F. 2) Heat your butter and water until it boils. Add the flour mixture. 3) Stir in your pan until the mix comes together into a homogenous mixture. 4) Transfer into a bowl and press the dough against the sides of the bowl to release the steam. Let sit for 5 minutes. 5) Grate some lemon zest into your dough to help make it taste less eggy. With an electric mixer, slowly add the beaten eggs gradually. Stir at medium-high speed until the dough because smooth and glue-like. Take a bit with your spatula and if the dough drops from your spatula, it’s ready. 6) Put your choux paste into a piping bag. 7) Pipe little domes onto a parchment-lined baking sheet. Dip your finger in water to smooth the peaks over. *optional*If you are adding your craquelin cookie tops, you can cut circles and put them on at this point, here’s a recipe I have used from I am a Food Blog’s site. 8) Bake for 15 minutes at 400F. 9) Without opening the oven, reduce the heat to 350F and bake for another 35 minutes. 10) Poke a small vent into the side of the puffs and continue drying in the oven door ajar for another five minutes with the heat off. 11) Cool on a drying rack. 12) Drill holes into the bottom of your choux shells and fill with pastry cream, see my recipe for that here. 13) Dust with powdered sugar or dip in caramel or chocolate. Next Gluten-Free Orange and Almond Cake with Peaches and Pistachios!